All boaters born after December 31, 1986 are required to carry the West Virginia Boating License on board to satisfy state boating regulations while operating on West Virginia's waters. The online West Virginia Boating License Test satisfies this state requirement. 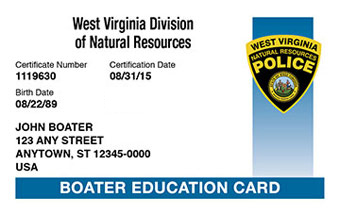 Passing the online exam allows you to obtain the West Virginia Boater Education Card and get out on the water right away! No one under the age of 12 may operate a powered vessel, including personal watercraft (PWC). No one who is 12 through 14 years old may operate a powered vessel, including PWCs, greater than 10 horsepower unless they are under the direct supervision of a responsible and competent adult who is at least 18 years old. Anyone born after December 31, 1986 must have a boater education card to operate a motorized vessel, or supervise an underage operator of any motor powered vessel in West Virginia. All boaters or passengers 12 years of age and younger on the deck or cockpit must be wearing their PFD while the vessel is underway. Boating License or Boating Safety Education Certificate...is there a difference? The boater education card is proof that you have successfully completed a boating safety course. The boater education card does not expire and does not need to be renewed. Therefore, it is NOT a West Virginia Boating License!